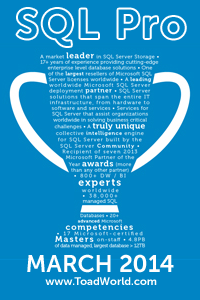 Want a free pass to the SQL Server Live! conference in Orlando this year? Look no further, here is your chance to win a free pass to the conference. Of course, you first have to answer a few questions to be considered! 1. The first 50 people to respond between September 16, 2013 – October 16, 2013 will be considered. 2. The Winner will be selected randomly from those that answered all the questions correctly. 3. This is only open to Current U.S. Residents! 4. This is a “Best Value” conference pass – which means it is for the conference only. Hotel/Flights and all other expenses will not be included. So here are the questions, please fill out the answers with your contact information in the form below. 1. Please briefly describe what SQL Server Always-ON means and what it does. Be careful… take this one slowly. 2. We keep hearing about In-Memory technology. Why is memory such a big deal for SQL Server, how does memory help improve performance?